“If it was successful or not, I’m not really sure yet,” she confessed. “The Set of Circumstances” is in partial fulfillment of Hayes’ dance thesis. Hayes, who performed her thesis, “The Set of Circumstances,” this past month. Hayes and fellow dancers in “The Set of Circumstances” rehearse. Hayes’ senior dance thesis, “Words into Action: An investigation of dance practice as tool to implement social theory” is partially fulfilled by “The Set of Circumstances,” which was performed Nov. 14 and 15 in Gannett Theatre. The performance featured Sydney Anderson ’20, Helen Carr ’21, Esme Goldfinger ’21, Flannery Black-Ingersoll ’19, Rebecca Howard ’19, Elizabeth Wellington ’20, and Hayes herself. In her program note, Hayes introduced her work as a piece that “is about and also that is.” When we spoke, she described that the “main driving force” of her thesis was a technique Hayes learned in Spain this past summer from performer and dance-maker Laura Aris. It was in Spain that Hayes encountered Aris’ “mechanics plus situation” movement structure. Hayes described the concept as a two-step process: “you define a physical mechanic and then you add a situation to it.” A particular mechanic in dance might be pouring one’s weight onto a fellow dancer; a corresponding situation might be that the two dancers interacting have a caring and loving relationship. Or, the corresponding situation might be a relationship defined by discomfort, or even malice. The richness of the structure is seeing how different situations affect the initial mechanic. Prior to performing her thesis, Hayes and the cast illustrated the structure for audience members. 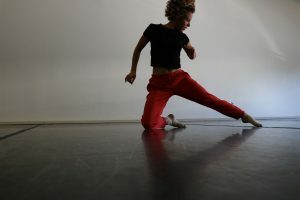 In choreographing “The Set of Circumstances,” Hayes was interested in exploring physical risk and emotion in “real time.” “How can we create situations that happen onstage that aren’t choreographed?” The choreographer further explained that she strives to incorporate tasks that one can “fail at” to discover the subsequent consequences of real time risk through movement exploration. Hayes explained that her experimental and unfettered choreographic structure is a departure from some of the pieces she created as a teenager. “Music is a motivating force for a lot of young dancers.” Now, the dance-maker said that when choreographing, she delves into questions regarding the power of the body and, in relation to Aris’ technique, the motivation of movement. Hayes’ work and experimentation absolutely paid off: “The Set of Circumstances” was effortlessly dynamic. The connection among the seven dancers felt authentic; they moved in sync amidst seemingly unplanned physical and audible interruptions. Hayes’ desired themes were quite clear, her choreography as manifested by the cast explored the relationship between community and the individual and challenged audience members to evaluate collective experience.